Dash Cam - Car Video Camcorder is an accident camera which records the traffic situation continuously in a loop. When it detects a high acceleration, be it an accident or just strong braking, it stores the last minute into the video library. 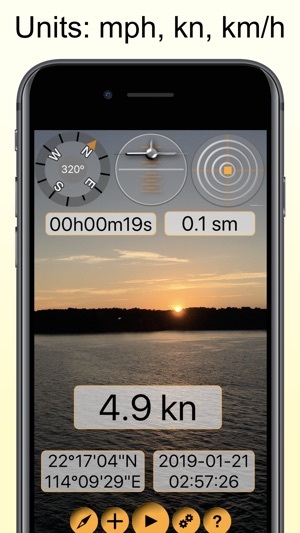 It allows to render all important telemetry data, such as speed, location, pitch, heading, distance, time, date, etc. directly into your video while it is recorded with your devices' camera. Thus any manipulation is nearly impossible. The 'head up display' instruments are freely configurable in size and they are movable in the picture frame. You can configure the length of the video loop and the 'incident saving delay'. The latter ensures that even the seconds after the crash are recorded as well. Further you can configure the strength of the acceleration that is needed to trigger saving the video. You might need to play around with that threshold depending on your car and your driving habits. • Dash Cam - Car Video Camcorder always tries to setup the highest fps camera mode available on the device. However the actual frame rates achieved are lower and they vary depending on the graphics power of your device. 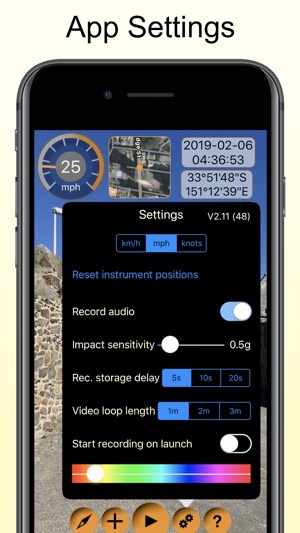 The realtime telemetry update along with realtime video movie recording and concurrent display update is a demanding process that requires certain power. Therefore older devices might experience lower frame rates. • Please note that Dash Cam - Car Video Camcorder can be started on devices without GPS support. However it does not make much sense on these devices since GPS-based telemetry data such as speed, location, etc. cannot be updated. 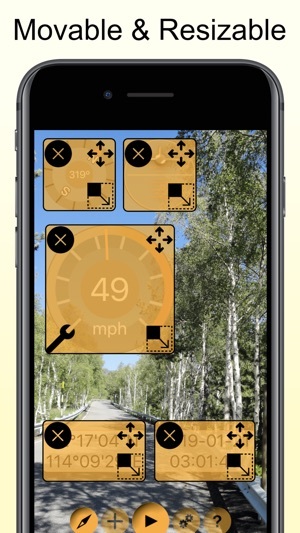 • Since nearly all battery consuming services like GPS, GPU graphics, gyroscope, video camera, movie encoding and movie recording are simultaneously used, the app is battery demanding. Take care of that! It helps to further develop Dash Cam - Car Video Camcorder. The pro version contains all IAP features and is ad-free. It’s a decent app that does what it’s supposed to. I dislike that I can’t open a different app in front of it and have it record in the background. It also only has a three minute record loop. It should go continuous or at least have a 15 min record time. That’s an average trip time. Note to developers: iPhone 7, if you open app, then close it (ex to open directions or play music) then reopen the app, it crashes immediately. And may take as many as 3-5 attempts to stop the crashing. Edit I lowered my rating. It puts such a demand on your device it causes it to overheat. This is on three different apple products. One star not usable. Thank you for your review. In iOS you can’t use the camera in background. That is the reason why that app only works in foreground. The record loop length does not matter, because it only records after crash events anyway. So 2 min. before the crash should be sufficient. Furthermore the free version only allows a limited number of usages. If buy the pro version you get unlimited access. 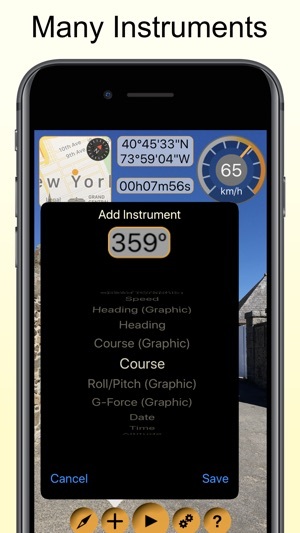 In order to reduce the computational demand of the app please reduce the number of instruments. This can be done in the settings by selecting “No instrument”. Great Program, question about time loop. I love the look and feel. Is there anyway to increase the time loop? Sometimes I want to keep the trip as a record, not an accident. 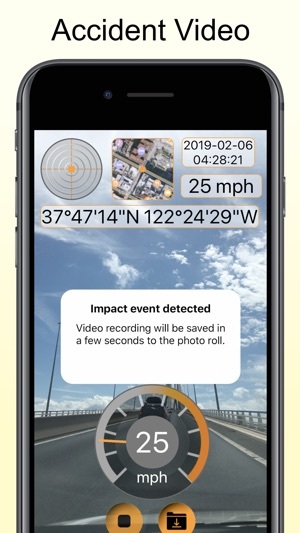 In this case we recommend our other app 'Timestamp camcorder', which offers unlimited recording in the sense of an action camera. Please try it ! Paid for the app thinking I could remove the things on screen I don’t want. Not too happy but it’ll do I guess. I’m just gonna go buy a real dashcam. This video is so grainy on an iPhone xr I honestly thought my camera was broken till I opened the regular camera which was perfect. You can remove unneeded "Instruments". Just go to the "Instruments"-Tab, click the unwanted instrument and select "No Instrument" in the Selection-Scroller. The instrument will disappear when you go back to main screen.